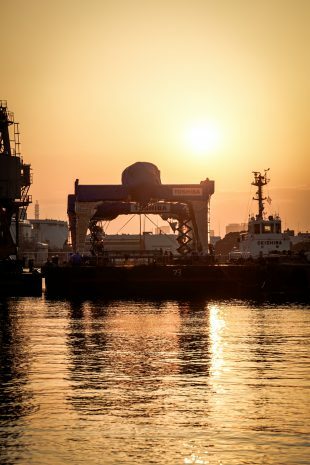 In July, the Tokyo Electric Power Co. (TEPCO) began the assembly of a domed roof for Unit 3 of its Fukushima Daiichi Nuclear Power Plants, in preparation for the removal of debris and fuel from the reactor's spent fuel pool. The roof is intended to provide a cover for the fuel removal efforts. On November 2, the fifth of eight roof units was lifted to the upper floor of the reactor building. Before the roof can be completed, though, a fuel removal system (FRS) must first be installed on the operating floor at the top of the reactor building. On November 5, the system was shipped from Honmoku Pier in Yokohama port, located along Tokyo Bay. The FRS consists of both a fuel handling machine (FHM) and a crane. The FHM is designed to remove debris and fuel from the spent fuel pool in a safe and secure manner, as well as to minimize radiation exposure. Operations to remove the debris and fuel can be monitored by cameras installed on two manipulators. Various auxiliary tools (such as cables, rebar-cutting devices, and grippers) can be installed at the tip of each manipulator. After the fuel is removed from the pool, it will be placed in a transfer vessel, lifted by crane, and moved to a ground-level floor of the reactor building for transportation to a temporary storage site. Using multiple cameras and other devices, the FRS will be remotely operated from a building near the Main Anti-Earthquake Building: an approach not seen in the past. 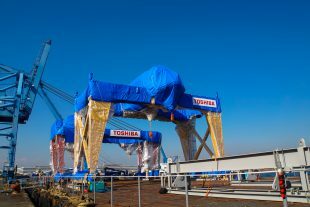 Toshiba Energy Systems & Solutions Corporation, which made the system, carried out extensive testing and training of operators before it shipped the FRS to the Fukushima Daiichi NPPs. After arrival, the FRS will be installed at Unit 3 around the middle of this month. According to the schedule announced by TEPCO, the installation of the dome will be completed in early fiscal 2018 (starting in April of next year) and removal will begin about around October or so.